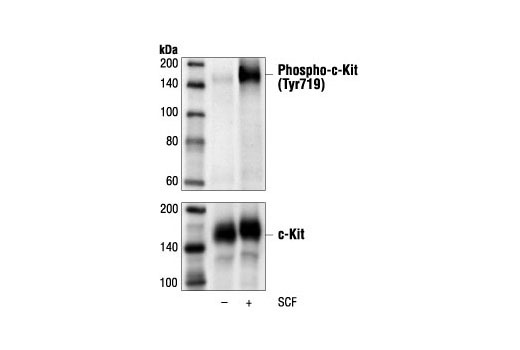 Western blot analysis of extracts from MO7e cells, untreated or SCF-stimulated (50 ng/ml for 2 minutes), using Phospho-c-Kit (Tyr719) Antibody #3391 (upper) or c-Kit Antibody #3392 (lower). The human SCF coding cDNA was obtained from human bone marrow stromal cell mRNA, subcloned into a prokaryotic expression vector and expressed in E. coli. The recombinant human SCF protein was purified and stored in PBS buffer containing 0.1% BSA. The EC50 for stimulation of TF-1 cell proliferation is 4-8 ng/ml. CST recommends using 50-100 ng/ml of SCF for stimulation of SCF signaling. Human SCF is supplied as a solution. It should be stored at –80°C. Aliquot the reagent upon receipt and avoid repeat freeze-thaw cycles. Stem cell factor (SCF) is a growth factor that is essential for hematopoiesis, melanogenesis and fertility. SCF is also known as mast cell growth factor (MCGF), steel factor (SLF), or kit ligand (KL) (1-3). SCF mediates its biological effects by binding to and activating c-Kit (4). SCF induces dimerization of c-Kit followed by trans-autophosphorylation of the cytoplasmic protein tyrosine kinase domain, leading to subsequent recruitment of signaling proteins, tyrosine phosphorylation of substrates and activation of multiple signaling pathways (5,6). SCF/c-Kit may take part in the growth control of human malignancies (7). Smith, M.A. et al. (2001) Blood Rev. 15, 191-197. Linnekin, D. (1999) Int. J. Biochem. Cell Biol. 31, 1053-1074. Huang, E. et al. (1990) Cell 63, 225-233. Jiang, X. et al. (2000) EMBO J. 19, 3192-3203. Ashman, L.K. (1999) Int. J. Biochem. Cell Biol. 31, 1037-1051. Ueda, S. et al. (2002) Blood 99, 3342-3349. Attoub, S. et al. (2002) Cancer Res. 62, 4879-4883.